You really have to love some of the humorous advertisement videos from the carriers, especially when some of them like to poke fun at the competition, but it’s even better when they literally pit two devices in an a fight to the death. 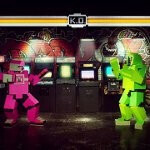 Well, you’ll particularly find T-Mobile’s video between the HTC Amaze 4G and Apple iPhone 4S very interesting, especially when they duke it out in an arcade style fighting match to find out which reigns supreme in the camera department. No, we don’t see side-by-side comparison photos from each respective handset, rather, the HTC Amaze 4G unleashes its depth of camera centric features on the confused iPhone 4S character. Although we’ve done our own comparison between the two smartphones, we’ll let you find out which device actually wins in this fight. Still, you got to love the humorous take that T-Mobile has gone with in producing this advertising video. It's funny how things change. Now the stereotype of Apple is usually the douche wannabe cool and for android they use that cool guy that doesn't care about being cool. it's a clever ad but picking out a few insignificant features doesn't mean the Amaze's Camera beats the 4S's. I own the HTC amaze and I still would pick a iphone 4S camera over my phone. Focus isn't always good, and on video recording it does not refocus, it focuses once based on what you're aiming at when starting the recording and you have to manually focus every time you record something at different distances. But overall it's pretty good, somewhat comparable, but by no means beats a iphone 4S polished camera.